Rod Phillips undertakes a large task in this 300-odd page book – to chart the history of wine in the western world, from the earliest known evidence of winemaking in ancient Mesopotamia to the latest consumer fashion. For the most part he succeeds admirably; dividing up history into a number of ‘wine eras’, he brings to life the social, commercial and agricultural aspects of wine in each era, together with fascinating glimpses of just what concoctions were being drunk – and how far away many of them were from what today we call wine. Through periods of success and periods of disaster, the impact of wine on western society has been considerable, and this book is highly illuminating as to how the various interests – from growers to governments, from traders to the temperance movement – have impacted both the quantity and quality of wine consumed over the centuries. If the book has a flaw, it is in its readability; in places the prose is somewhat turgid, and it sometimes seems to jump around somewhat chronologically. Whilst anyone with an interest in wine and / or history will enjoy this book, it perhaps won’t grab the attention of the more casual reader. But for those who are interested, this is a book to be recommended. So I meandered around for a while rather aimlessly; after various excursions by the waterfront around Double Bay I ended up heading to Watson’s Bay via the Old South Head Rd. I had a rest when I got there, as I was rather tired, so I sat and looked at the view for a little while. Then I headed back via the New South Head Rd. The climb out of Watson’s Bay was hard work, but even harder work was the not especially big hill coming into the city on Craigend St; this I really struggled with. Indeed, I was actually finding it hard to breathe going up here; I’ve never had asthma, but it felt (and I sounded) rather like that as I struggled up the hill. I made it to the top, and tried to catch my breath, still gasping away. I managed to get a really good lungful of air into me, and then, almost instantly, the breathless feeling went away, and I could breathe easily again. Very strange; the lights went green and I got going again, and felt much better, and much fresher. Could it have been exercise-induced asthma brought on by the heat and poor air quality? I don’t know, but it wasn’t very pleasant. It’s also possible that I’m just not as fit was I was. I’m getting older (I turn 38 tomorrow! ), and maybe it shows. Funnily enough, I did a very similar route to the one I took today after Xmas last year (or possible the year before; Bikely rather annoyingly doesn’t show the year when a route was added). I did it on the same bike (although it’s possible that at that point I had it set up as a freewheel singlespeed, rather than a fixie), but last time also managed to detour to Bondi and spin around Centennial a few times, and as I recall didn’t really stop for more than a drink and a snack at Watson’s Bay. Am I getting too old? Is the mistress (as I wondered about at the end of this blog) getting too hot for me to handle? Are my days of blasting up Heartbreaker Hill on a 48×17 gear numbered? Or do I just need to get out and ride more (which, to be honest, I haven’t been doing as much of over the past few months)? I guess 2010 will reveal all! Everyone should ride a bicycle. If everyone rode a bike, the world would be a friendlier place. 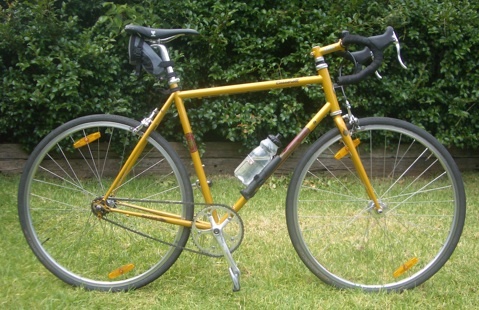 This is the bike I bought several years ago to start riding to work on. I hadn’t ridden for years, so didn’t want to spend a lot. It was very cheap on ebay! 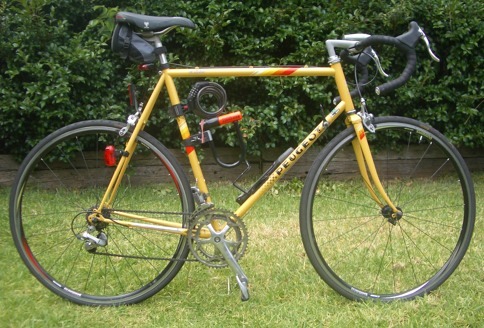 Of course, I rediscovered my love of cycling (why did I ever stop? Ahh, the pernicious seduction of the motor car!) and rode it to death. When I bought it it had all original parts, and I suppose could have been done up as a vintage restoration job. But I just thashed it to work and back for months, ans as bits fell of it I replaced them. So much so that the only original bits now left are the frame, forks and front derailer. When I took these pictures, I also recorded the serial numbers of them. 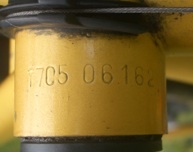 Lots of bikes get stolen, and then recovered by the police, but can’t be reunited with their owners because the serial number is pretty much the only thing the police note down, other than a very general description (eg ‘yellow mountain bike’) – making it hard for them to check if they’ve got your bike, even if you have a detailed description.